The Rockefeller Center Christmas tree lighting ceremony is happening at the Plaza Wednesday. The glamourous event always heralds the official start of the holiday season for us. We are suddenly struck with cravings for hot apple or cranberry cider to warm us during frosty evening strolls. 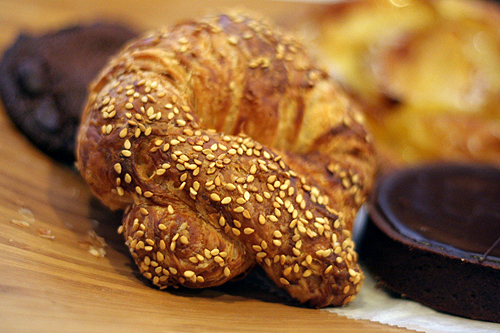 Something even more Manhattan: a cup of luxurious molten chocolate and uber fattening pretzel croissant from City Bakery. Since we have the next month of rich and fattening treats ahead, we’re going to scale back but still celebrate the start of Christmas in New York. We’re talking pizza, people. And not just any pizza. A crunchy, garlicky, broccoli and mozzarella pizza topped with roasted grape tomatoes, a la the season. It’s even red and green, people. We still swoon with memories from our hot slice from Famiglia Pizzeria on Madison and 97th Street on a cold autumn day. In a pinch, the spicy broccoli topping works perfectly on whole wheat pita with crunchy results. We like the smaller size, also. This is going to be a long month of parties and goodies, after all. Let’s not get crazy. Spread nuts out on a cookie sheet. Toast in the oven until they become light golden brown, about 10 minutes. Thoroughly toss the warm toasted nuts with the spiced butter. Toast for another 5 to 10 minutes. Let them cool but serve warm. In fabulous sterling silver nut bowls, natch. Above: Tommy Bahamas Tropical Cafe serves hot, freshly baked pull-apart loaves with sweet cream butter whipped with honey, cinnamon, nutmeg and ginger. The possible combinations for compound butter is confounding. Lashings of sweet and savoury spreads for breads, vegetables, seafood, poultry, beef. Herbs, spices, nuts, chilis, sugars, cheese, fruit, dried mushrooms… literally millions of tiny tweaks you can create to invent your own maitre d’ hotel butter. We adore the idea of sitting down to afternoon tea with friends with a steaming pot of brew and slathering freshly baked scones with strawberry butter. Or the dreamy cinnamon-nutmeg-honey number we melted on hot sourdough at Tommy Bahamas. So civilized. Ditto for a lemon-garlic-thyme butter spread under the prised skin of a plump chicken for roasting. Gorgonzola butter melting a top perfectly grilled steak. Dried porcini mushroom and parsley atop a fancy burger. Wasabi pea butter with salmon. Chipotle-bacon butter on a baked potato. Fresh serrano chili and lime glistening on corn. While we know our adoration for compound butter is dangerous and potentially deadly for our skinny jeans, a little goes a long way. Shaping your butter mixture into a log and refrigerating until it’s solid enables to you slice off a disc or two for company. Why we didn’t snap up that baby madeleine pan is beyond us. Imagine little scallop-shaped pats of compound butter for guests. Butter molds can be found at flea markets and good kitchen shops, but the thought of acquiring yet more gadgetry makes us weary. Be creative with what you have. Roll semi-hardened balls of butter down a cheese grater or rasp for texture. Although, we are also dreaming of lining an elegant ramekin with plastic wrap, filling with soft butter until it solidifies into the perfect shape before removing and sealing tightly in a freezer bag. Thaw by popping the butter back into a room temperature ramekin in time for company. A lovely accompaniment to Neiman Marcus Monkey Bread, below. Whip butter in a bowl with electric mixer until fluffy. Return to refrigerator and allow butter to solidify. Cut into 2″ diamond shaped pieces. Arrange in a 4″ pie pan, 4 or 5 overlapping pieces per loaf. Place the oil into the food processor and add the chives. Process until the chives are finely chopped. Add the remaining herbs and blend until the herbs have colored the oil. Using the whisk attachment, whip the butter in the mixer work bowl at medium speed until it softens and lightens in color, about 5 to 7 minutes. Add the herb oil to the butter and beat for another 2 minutes until oil is fully incorporated. Remove butter from bowl and spoon onto parchment paper or plastic wrap. Roll into a log using the edge of a baking sheet to form a tight log. Chill for 2 hours before serving. Anchovies aren’t for the faint of heart. But imagine a Caesar salad-style butter, all lemon,garlic, parmesan and black pepper goodness oozing across a grilled chicken or salmon salad. From Lucy Waverman: Anchovy bread works well with a platter of hors d’oeuvre as well as alongside steak. Substitute 2 tablespoons of anchovy paste for the anchovies if you prefer. Slice baguette lengthwise into 2 and cut each half into long triangular strips. Combine anchovies, garlic and melted butter and brush bread with anchovy butter on the cut side. Sprinkle with Parmesan. Place baguette on grill and grill for 2 minutes or until the bread is browned and parmesan is melting. Serve one slice with each steak serving. And we’re not the only ones obsessed with football parties. We’ve named the potato skin the official football food winner. Portable finger food wins every time. We’ve also tried making skins with sweet potatoes roasted with maple syrup, pecans and comte cheese – divine. But we like this recipe for it’s hot marinara-style dip. Preheat the oven to 375 F (180 C). Prick each potato several times with a fork and set on baking sheet. Bake the potatoes until tender, about 60 minutes. Cool the potatoes to room temperature. While the potatoes cool, remove the sausage meat from its casing. Place 1 Tablespoon of the oil in a skillet set over medium to medium-high heat. Pull the sausage meat into small, 1/4-inch long pieces and set in the skillet,Cook the pieces of sausage until entirely cooked through, and then drain well, place in a bowl and set aside. Line a large baking sheet with parchment paper. Cut each potato lengthwise in half. Scoop out enough of the potato flesh to create a half-inch thick shell of skin and flesh. (Refrigerate and reserve the potato you scooped out for another use, such as hash browns). Bake the potato skins at 375 F (180 C) for 15 to 20 minutes, or until the cheese is melted and golden and the potatoes are well heated through. Arrange the potato skins on a platter and sprinkle with parsley. Serve a bowl of the pasta sauce alongside for dipping. Although we have our go-to Grey Cup grub, we recently spotted this yummy oh-so-Canadian menu contribution. We are still a bit obsessed with chicken lollypops, but shudder at the thought of scraping down all those slimy wings again. We haven’t taken these for a spin yet, but they make us think they would be delicious served alongside Buchanan’s super amazing Lemon-Rosemary and black pepper pan-roasted chicken drumettes (untested clone recipe at bottom). The crispy, tart, dry, peppery wings would go well with the sticky, spicy maple ones, we suspect. Cut chicken wings into 3 sections; discard wing tip sections. In a large resealable plastic bag, combine wings, Worcestershire sauce, Tabasco, palm sugar and chicken wings. Shake well and refrigerate for as little as an hour and as long as 5 hours. Shake the bag every hour or so. Drain and discard marinade. Oven bake at 375 F (190 C) for 15 minutes, then remove and set aside to rest, allowing juices to settle. While the wings are baking, add the remaining ingredients except for flour in a bowl and whisk together. This will act as your sauce. 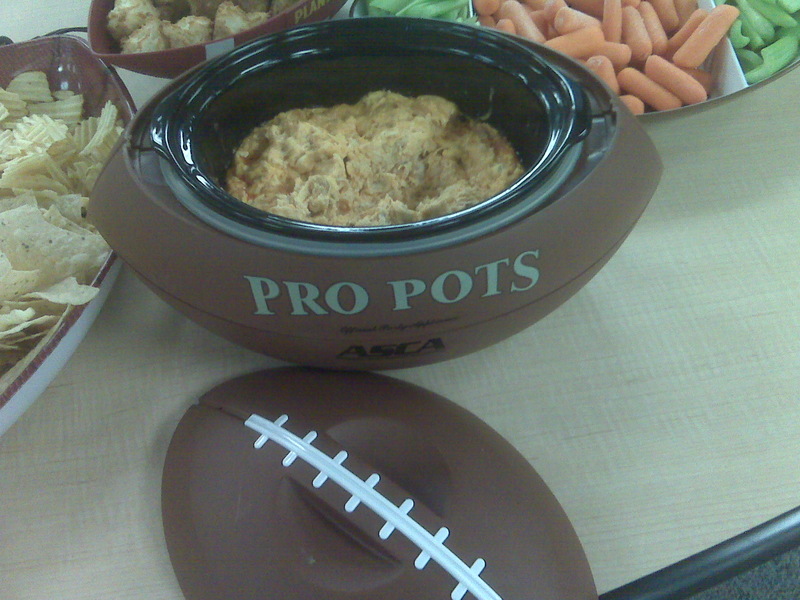 Be aware the sauce will really turn the heat up – perfect for a cold football day. After the wings cool down, toss them into the flour and deep-fry until crisp. Remove wings and toss them into the sauce for saucy wings or serve the wings crispy and the sauce on the side as a dip. Blend all ingredients except chicken wings. Put chicken wings in a bowl. Cover with sauce. Chill at least 12 hours or overnight. Heat oven broiler. Broil wings on cookie sheet, stirring as needed, until browned and cooked through, about 10 minutes. It’s the eve of Grey Cup, and we know what that means. Football party. But no Pil and doodles for this crowd on game day. What’s your favourite football recipe tradition? Let us know. Here are some of our most time-honoured recipes. We see a number of similar recipes online calling for additions of, gulp, ranch dressing. What on earth is wrong with you people? This recipe is best at its simplest. Mix well and add to crockpot an hour before serving. We serve with celery and carrot sticks for dipping. Mix meat and breadcrumbs in a bowl. Add chopped onion, cilantro, garlic powder, chili pepper flakes, black pepper and salt. Beef may be seasoned and left for an hour or two before proceeding. Add milk and egg and mix lightly with a fork. Shape into 2.5cm/1-inch balls. Place in a single layer in an ungreased pan and bake at 200C/400F oven for 10 to 12 minutes; drain well. Melt butter in a saucepan and saute garlic until tender. Add ketchup, honey and soya sauce. Bring to a boil, then reduce heat, cover and simmer for five minutes, stirring occasionally until sauce thickens. Add meat balls to sauce. Return to boil and simmer uncovered for five minutes ensuring all meatballs are glazed. Serve in a dish with toothpicks. Makes about 24 to 32 meatballs. Place onion, peppers, cilantro and garlic in food processor and blend until finely chopped but not completely pureed. Add cream cheese and blend briefly to mix. Turn into a bowl and add next eight ingredients. If mixture does not bind properly, add additional cream cheese. It should not be runny or falling apart. Stir in cooked and chopped chicken breasts, and adjust seasoning to taste. Cut mini pitas in half and stuff a little of the mixture into each pocket; it doesn`t take much. Place on tray in a 350F/180C oven for three minutes or until hot and cheese is bubbly. Serve with your favorite salsa or crudites. In a large skillet, combine all ingredients except mushrooms. Cover and cook on low heat for 10 to 15 minutes, stirring occasionally until sauce slightly thickens. Add mushrooms, continue stirring for another five to 10 minutes, allowing sauce to penetrate mushrooms and thicken further. God forbid you should find yourself in the dire circumstance of having too much leftover Halloween candy. UPDATE! THREE WAYS TO MAKE DO WITH IT. : Halloween candy-stuffed apples and Candy Pie. We vote for the former! Using an apple corer and small melon baller, scoop out the stems, cores, and seeds from the apples, leaving the bottoms intact. Cut off the top 1/2-inch of each apple and then stand in a baking dish. Stuff the roughly chopped candy bars in the apples (2 total tablespoons of candy per apple). Place 1 1/2 teaspoons of butter in each apple on top of the candy. Stuff the finely chopped candy in the apples (2 total tablespoons of candy per apple). In a bowl, whisk together the cider and sugar. Pour over the apples. Bake uncovered until the apples are tender, 1 hour and 20 minutes. Place the apples on plates and top each with a scoop of ice cream. Spoon the pan juices over the ice cream and serve immediately.